Live TV is parent-led, and often reserved for family time. Most of the children in the study watched live, scheduled TV, though only a small number did so daily . Live TV viewing was often convened by parents, allowing the family to come together to watch soaps, quizzes or ‘appointment viewing’ such as Strictly Come Dancing or The X-Factor . 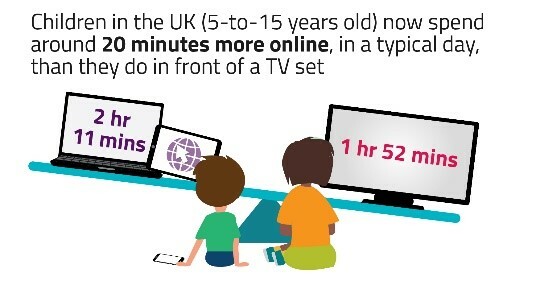 Some children used live TV to fill time, often while they were doing something else such as eating dinner. Hobbies and passions . Lots of children watched videos related to their offline interests – such as tutorials to further their passion for music or football. Some experienced similar gratification watching others participating in hands-on activities – such as arts and craft, or playing sport – to the extent that they said they no longer took part in these activities themselves in the ‘real world’. Vloggers and community . Many children watched ‘vloggers’ or YouTubers, often connecting with them through a shared passion such as sports or crafts, and enjoying becoming part of their ‘follower’ community. Lots of the children said they looked up to their favourite vloggers as role models, or regarded them as a friend who could provide support or advice. This type of content also appealed to children’s natural curiosity about other people’s ‘normal’ lives; they felt the videos had an authenticity which made them easy to relate to. Sensory videos . Many children enjoyed videos which included ‘satisfying’ noises – such as other people making and playing with slime, or opening presents. Such videos are described as ‘Autonomous Sensory Meridian Response’ – due to their ability to generate a feeling of well-being and relaxation among some people.